With many spring seasons wrapping up, May posed a good opportunity to look back at some of the biggest feature releases from 2018. Sometimes our development team moves so fast, it is easy to forget about some important updates that can help you later in the year. 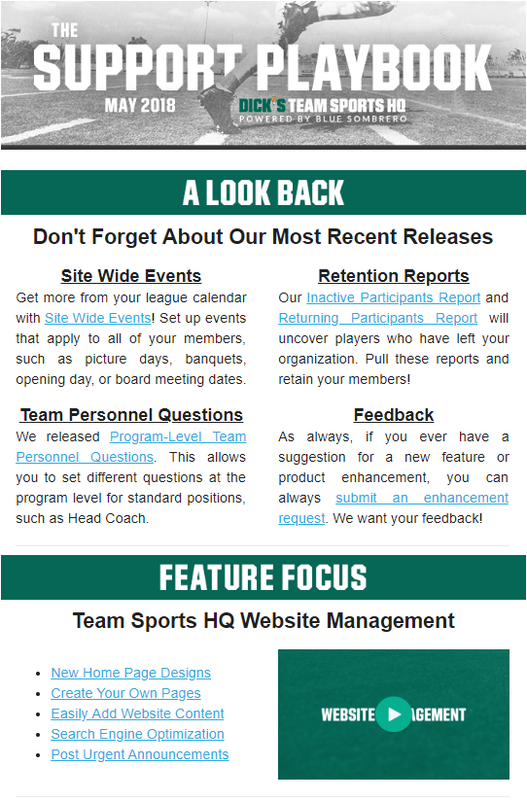 Summer is a slower time for most sports leagues, and often a good opportunity to update website content ahead of the next season. Our Feature Focus highlights website management and how easy it is for anyone to maintain a professional looking site. Speaking of professional content, designing a professional quality logo can be tough to get for volunteer run organizations. However, you don’t need to know a designer in order to create a good looking logo for your league. Our “Did You Know” section highlights a few ways in which anyone can create a high quality logo. The summer is usually tryout season. Good thing Team Sports HQ has a registration process catered specifically to this process! And finally, we would love to get customer feedback around our Online Registration experience as we look to add more functionality to it in the near future.